You can use Project groups to categorize and report project information in a variety of ways. Grouping also allows you to view rolled-up summary information of tasks, resources, or assignments in sheet views. On the View tab, in the Task Views or Resource Views group, choose the view you want. 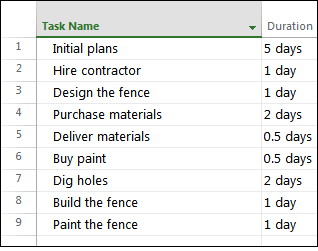 To group tasks, select a sheet view such as the Gantt Chart, Task Sheet, or Task Usage view. You can also group tasks in the Network Diagram view. To group resources, select a sheet view such as the Resource Sheet or Resource Usage view. On the View tab, in the Data group, select the group you want from the Group by box. And here's a before and after view of a project grouped by task status. On the View tab, in the Data group, choose More Groups in the Group by box. 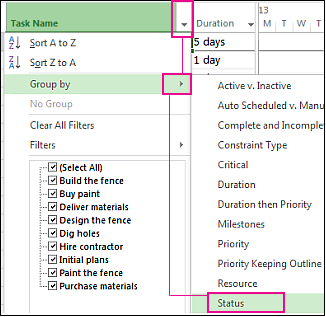 Under Groups, choose Task or Resource, select a grouping criterion, and then choose Edit. Under Groups, choose Task or Resource, and then choose New to create a new group. In the Group By row, in the Field Name column, select one of the fields you want to use to group tasks or resources. In the Then By row (below the Group By row), in the Field Name column, select an additional field you want to use to group tasks or resources. In the Order column, select Ascending or Descending for each field. To select formatting options for each field, select the Field Name column in the Group By or Then By row, and then, under Group by setting for, choose the options you want in the Font, Cell background, and Pattern boxes. 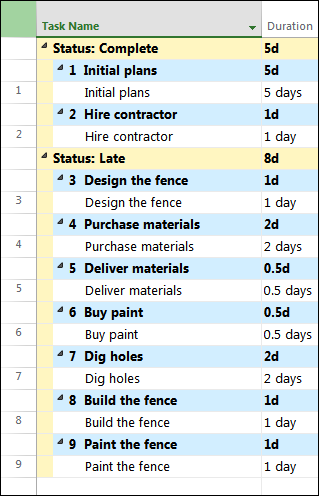 Add more levels of grouping by completing additional Then By rows. Choose Save, and then choose Apply. To return the view to its ungrouped state, in the Group By box, choose No Group. On the View tab, in the Task Views or Resource Views group, choose the view you want. To group assignments, select the Task Usage or Resource Usage view. Select the Group assignments, not tasks or Group assignments, not resources check box. Choose View > Group by > No Group. In the Network diagram, choose View > Group by.